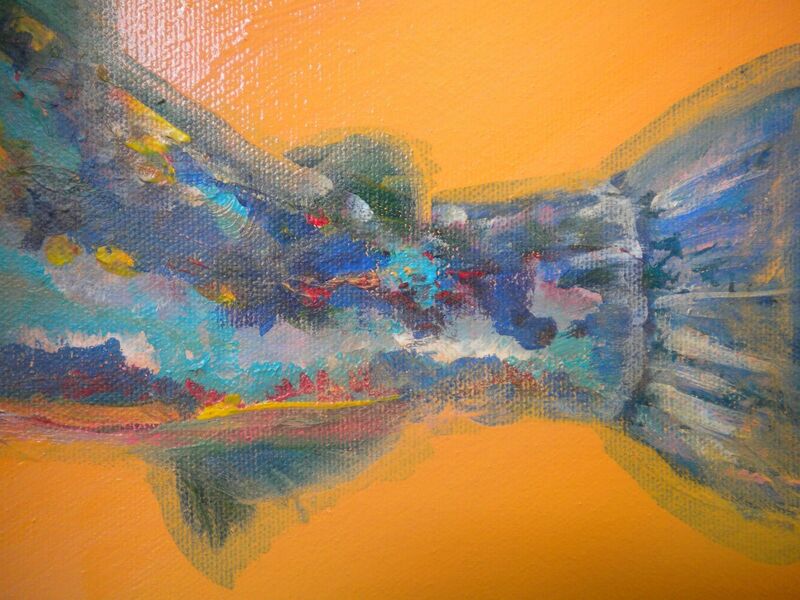 Fish 4 – I’m having issues!!! Gah, I always have such GOOD advice to give other people when I’m teaching painting, and yet, I don’t abide by it myself. 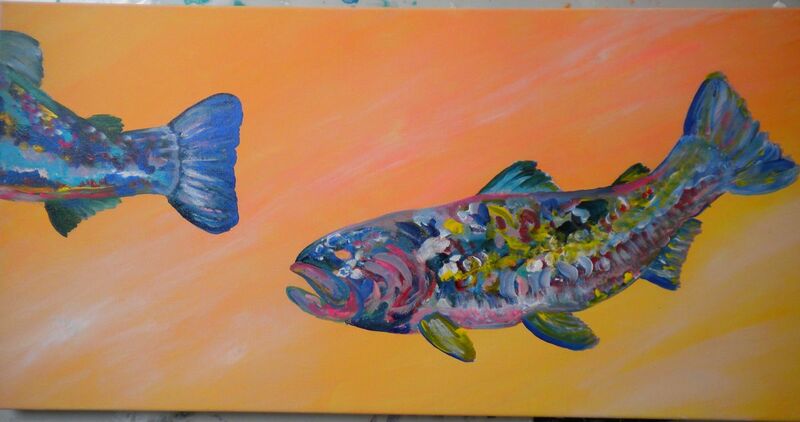 My intent for the fourth fish was to continue with the Pink/Orange palette, but have an orange’ish background this time. 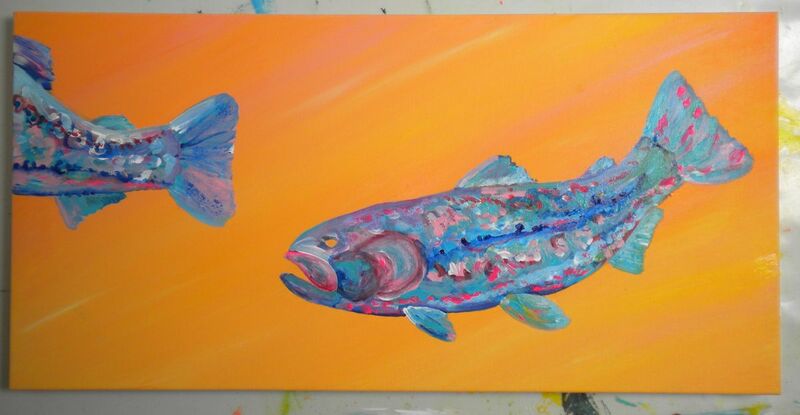 Since the whole fish will be outlined in black, the colors must, overall, but fairly light and bright, otherwise the black outline isn’t really going to show up. Also, I know, from experience, that I’d better get the background EXACTLY the way I want it, because mucking about with it later does not work. 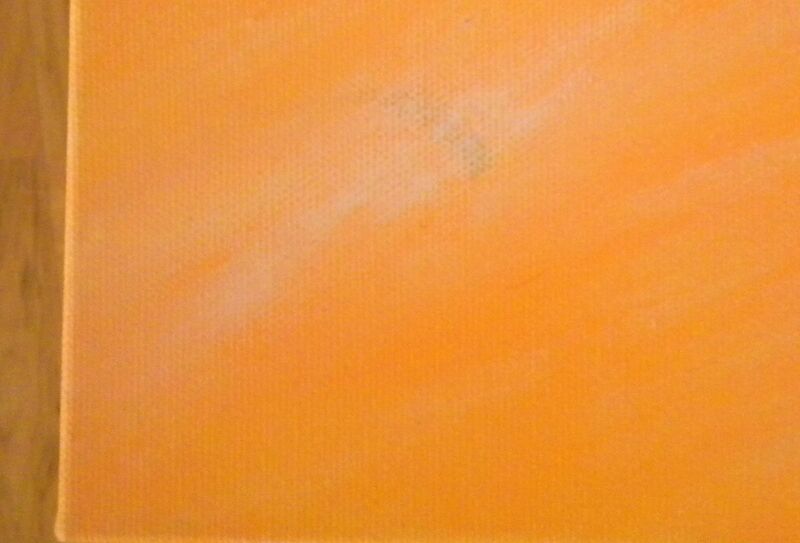 I did this great background, however there were a couple of teeny little marks where I’d splattered some dark color on the canvas BEFORE I’d laid down the orange: I could see them, but I thought they’d be easy to cover up with a bit of white later. Yep, that’s right – later. What the heck??? Didn’t I just say get the background EXACTLY right first? 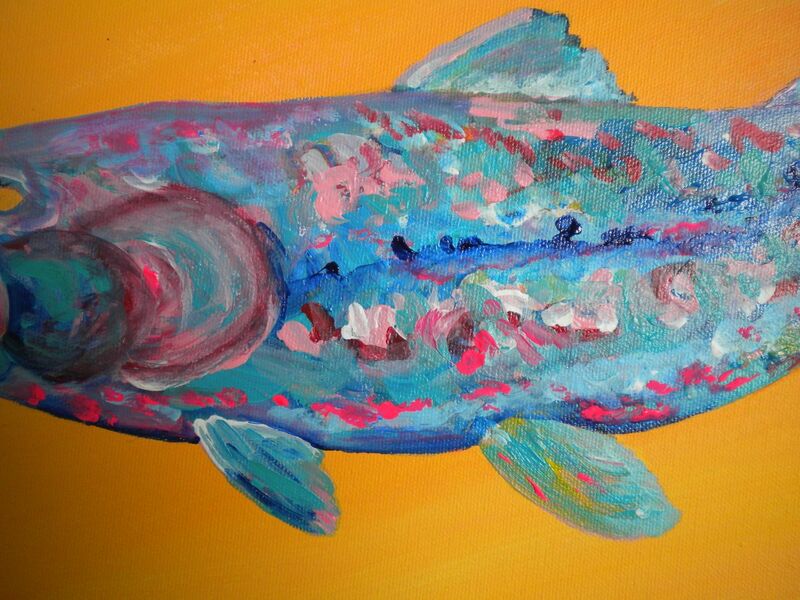 So, I painted in the fish, which were going to be LIGHT, BRIGHT blues and pink. Do these look like light, bright blues and pinks??? Gaaah, what the ????? How did they get so dark? Did I lose consciousness and my evil twin painted in all those dark blues and muddy purples??? Well, that is just YUCKY! If only I’d listened to my own advice! 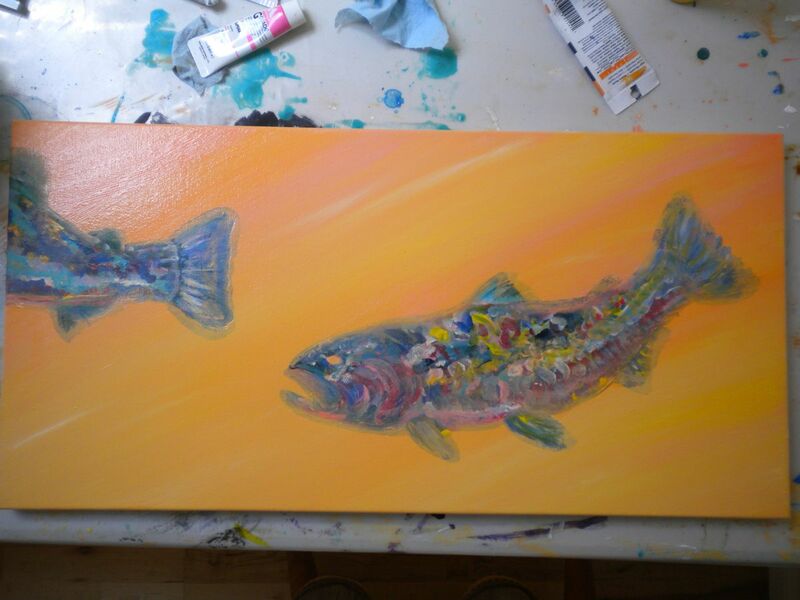 So, I got out the Gesso, and orange, and orange-red, and yellow and re-painted the whole darn canvas. Really made sure I covered up the little dark marks. 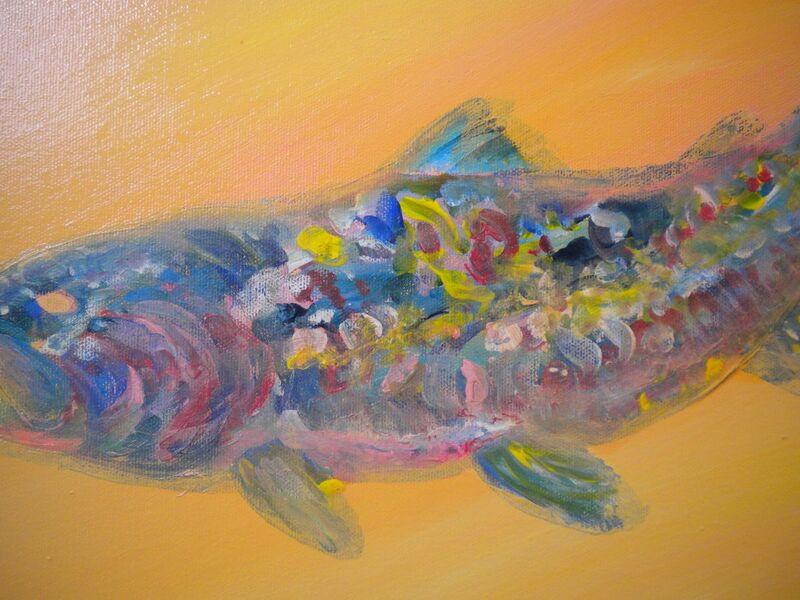 As I was sitting there, literally watching paint dry, I decided to wipe the excess paint off the fish. It looked kind of cool, slightly ghostly. Finally, the orange had dried, and I’ve gone back in with lighter colors, and here’s where I’m at so far. Not loving it; not hating it. It might still look good once I add the black outlines. 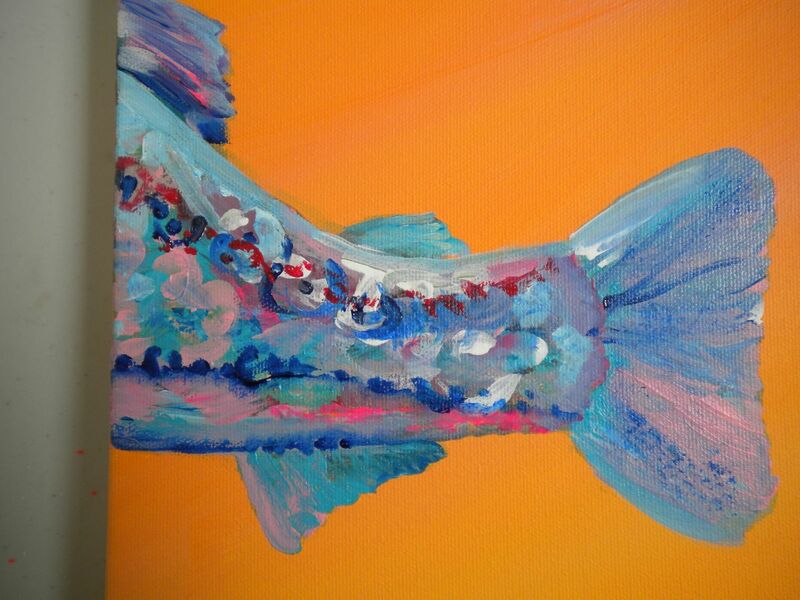 Some days your paintings fight back, and sometimes they win….. 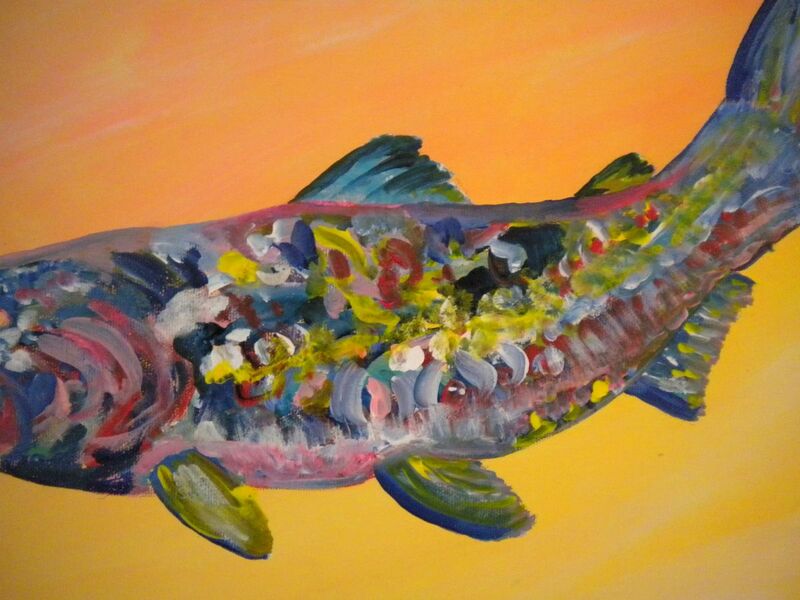 This entry was posted in Acrylics, Fish, outline scribble style and tagged acrylics, fish, outline scribble style. Bookmark the permalink. 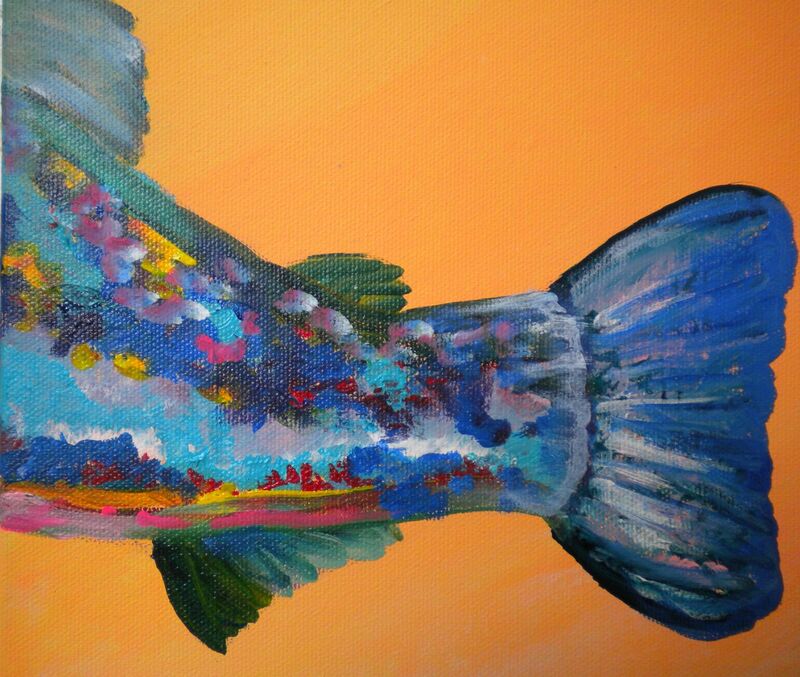 6 Responses to Fish 4 – I’m having issues!!! What are you suggesting?? That we start listening to our husbands??? That’s crazy talk, girl! RE: Your paintings fighting back!!!! You have to love the do-overs you get with acrylics. No Kidding!! Try that with watercolor, eh?